We are all about saving YOU time, so here is a guide so you can go directly to the page that is most relevant for you. and Get a Pay Rise at the Same Time!" Click here to Discover the Secret Now! Find general life balance or time management information here. If you want quick time management tips you can easily use go here. Tying to decide what planner you should use. 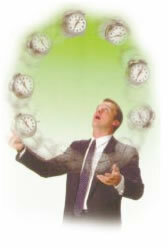 Here is an overview of leading time management planners. Are you considering which time management system is for you – find out here. Want to read a time management books or book summary – find reviews here. Are you looking to understand the skills you need for effective time management – go here. Are you interested in business time management, reducing stress and burnout at work? You can find help here. If work life balance and family time management is important to you go here. Looking for time management articles to motivate people or use for your newsletter – find them here. Job Burnout -- How to avoid getting burnt out at work. Time Management Forms -- Download forms that will help you save you time. Time Management Planners -- A short summary of leading planners to help you decide what is best for you. Time Management Quotes -- Time Management quotes that inspire. Famous people on time. Quotes about time that make you laugh. Time Management Activities -- Activities that help you get things done. Time Management Articles -- A comprehensive library of time management articles with information that really saves you time. Time Management Books -- Reviews of time management books to save you time working out which books you should read. Subscribe to our monthly newsletter, "Time Creation" and get articles on time management, and occasional bonus gifts and goodies! I promise to use it only to send you the Time Creation Newsletter.